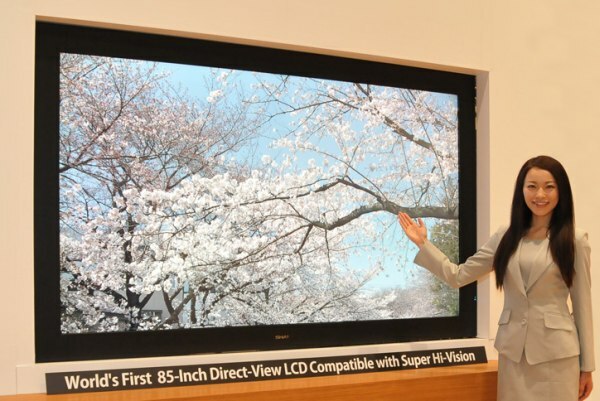 While Japan's NHK has been working on the successor to HDTV, Super Hi-Vision, for years, there haven't been any direct-view HDTVs capable of showing its full 7,680 x 4,320 pixel resolution until this prototype unveiled today by Sharp. Its 103 pixels per inch may be just a fraction of those found in some of the pocket displays we've seen at SID this week, but that's still far more than the 36ppi of a 60-inch 1080p HDTV. If estimates are correct, we'll still be waiting until around 2020 for that 33MP video and 22.2 channel sound to actually be broadcast, although there's a possibility of some demonstrations happening during the 2012 Olympics. Skip past the break for the available specs and a video demonstration, or just head over to the NHK's Science & Technology Research Laboratories in Tokyo between the 26th and 29th of this month.